Create and Celebrate the men in your life with this classic 'dad' card - perfect for Father's Day or any day. 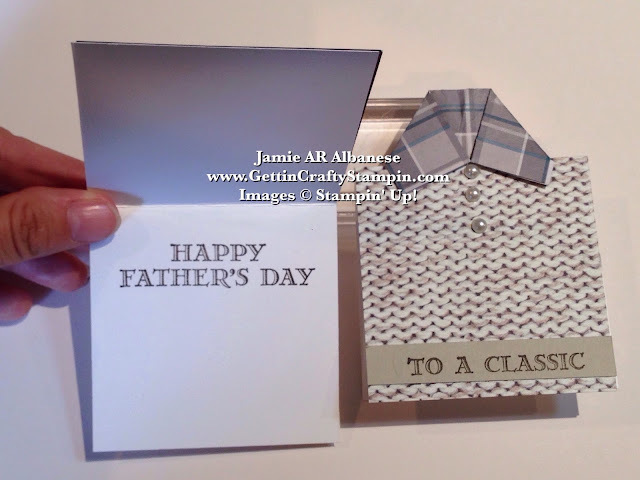 This easy but very masculine hand-crafted card is perfect for your good ol' dad or any men in your life. We had a blast creating these at a recent Stamper's 10 Club... Join Us and create and connect for one hour a month while scoring a fun shopping spree! I love that the 12" Whisper White card stock makes these cute 3" square cards (you get 8 cards from one sheet of paper!!). They are a fun size and does not require much writing (my Father-In-Law doesn't like to read long cards). Here the classic look of the Guy Greetings stamp set is sharp on the Whisper White card stock (inside) and the Sahara Sand 1/2" strip to the front with the Early Espresso ink. Create this stylish sweater look with ease. We had this fun paper that went away in our Occasions Mini. 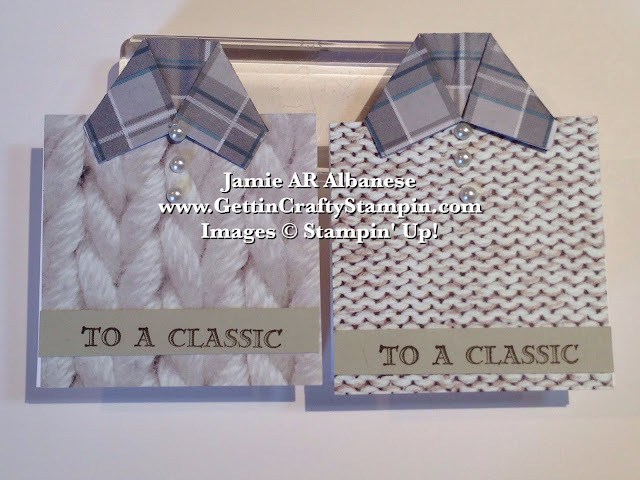 ~ Using this plaid print in a 3"x 2" strip score it down the center along the length. ~ Fold it and then fold it softly down the middle. The middle fold (like the bottom left box) gives you a point where to turn the collar in. 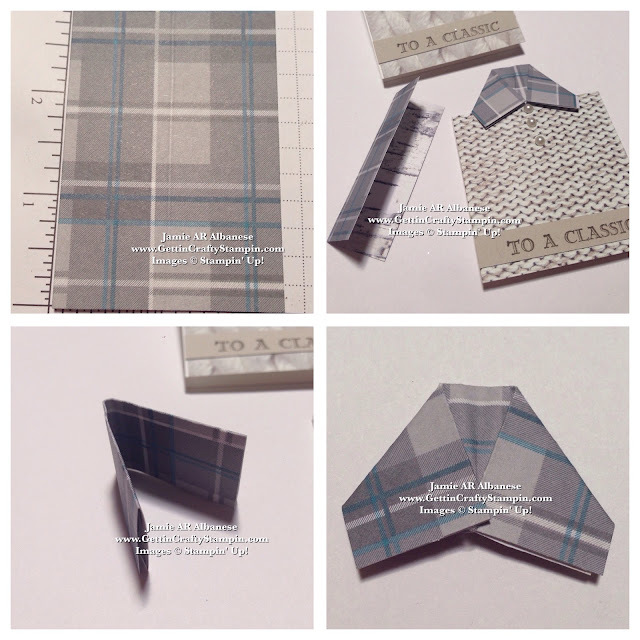 ~ Fold down each flap and hold it down with our Mini Glue Dots. Layer it over the pretty cable knit looking page and the Mini Glue Dots work like a dream (super strong while mini!!). This reminds me of every TV Dad you'd see as I grew up (my Dad and Grandpa were plaid flannel men or western cut shirts). 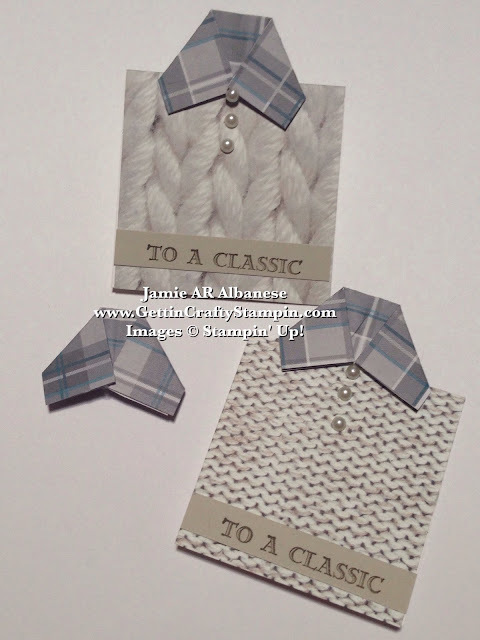 The addition of our adhesive backed Pearl Jewels give a look of elegance to this stylish and masculine card that is perfect for Father's Day (or any day a man needs some cheer). Men, too, require cards that celebrate who they are. Using this quick and easy look with our fabulous double sided Designer Series Paper you can deliver some warm greetings.